Special tonewood paired with a mix of classic and contemporary appointments. 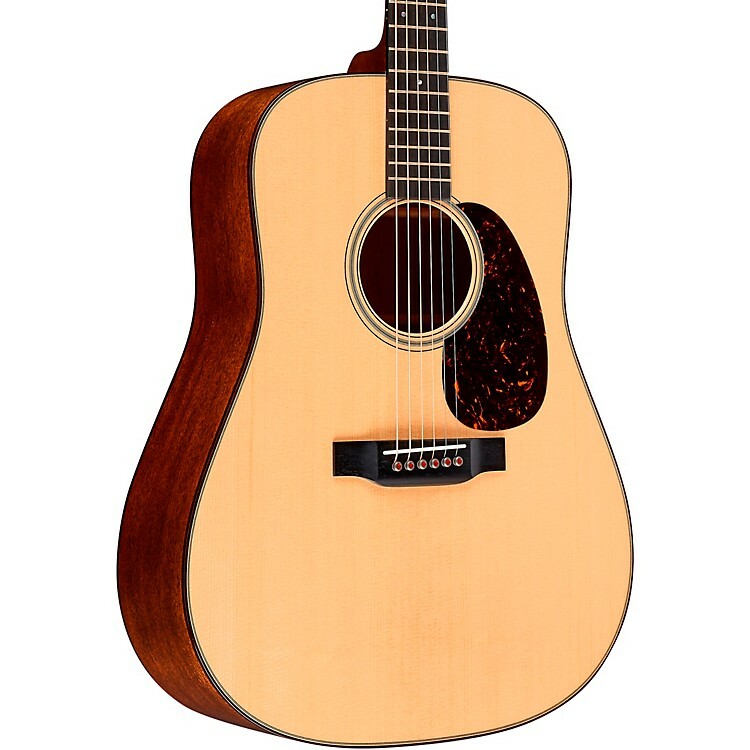 The D-18 Modern Deluxe is a new take on a Martin Vintage. This guitar is packed with custom features and modern technology that you have to see, feel and hear for yourself. The vintage appointments include a Sitka spruce Vintage Tone System (VTS) top, a dovetail neck joint and natural protein glue construction that give it the rich, fully aged Martin tone that has inspired generations. The look is unlike anything in Martin's production line to date with East Indian rosewood binding, stylish gold frets, gold open-gear tuners, and a unique 1930's style script logo inlaid in pearl on the headstock. Some ultra-modern features include a titanium truss rod, Liquidmetal bridge pins with red dots, and a carbon fiber bridgeplate that boosts volume without adding weight. Martin has also given the D-18 Modern Deluxe a new neck shape that is slightly skewed for maximum hand comfort up and down the fretboard. This guitar is anything but standard. Make this Martin yours with a quick click or call today.